i was trying to figure out how to clean out the freezer before the end of the year. i came a cross a ton of frozen quart bags of chili, sauces, beans, soups and meatballs and a bunch of expensive meat. the biggest find was a couple of pounds of tenderloin tips, perfect i thought for topping rice bowls but that wasn’t going to free up any meaningful amount of space. an irresistible sale on mushrooms, left me with a fridge full and a need to use those up, as well. a scan of the kitchen and i spied a forgotten open bottle of pinot noir, with just a glassful missing. 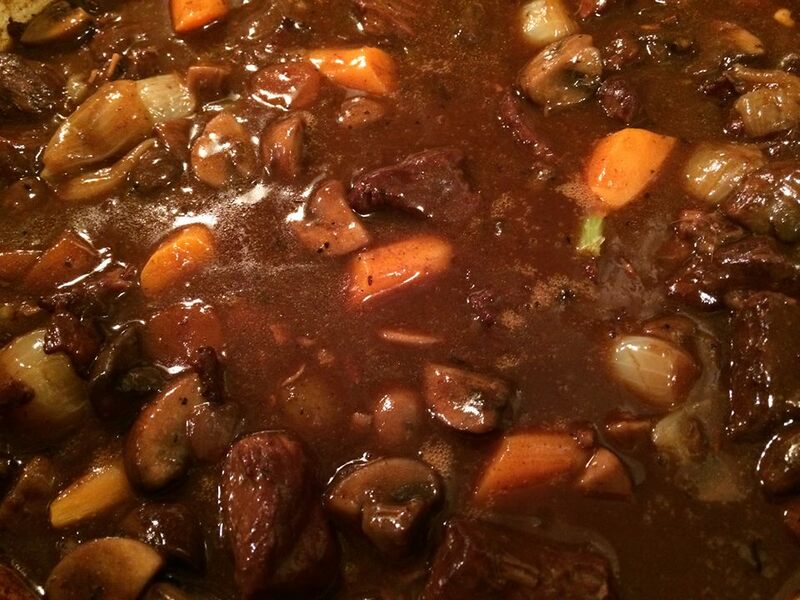 the universe was screaming at me, boeuf bourguignon, it’s fate, seize the day! 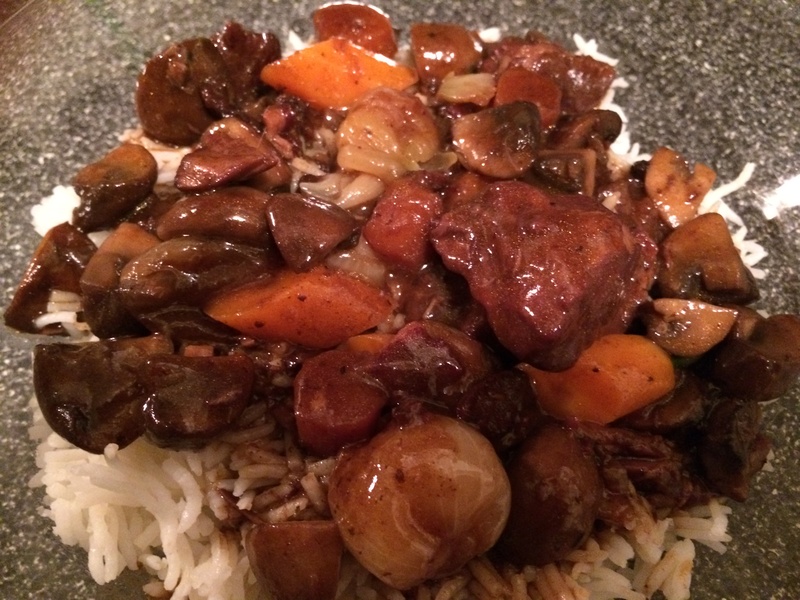 julia child’s boeuf bourguignon was one of the first “fancy dishes” that i’d ever cooked for my family as a kid. later, someone pointed out to methat it’s just stew with wine in it. I’ve made the dish enough times to have made changes to simplify it. there are still lots of steps, but i have eliminated most of the clean out the pot type steps in the original recipe. honestly, nothing really bad will happen if you can find more pot switching, set aside steps to cut out. anyway, i was pretty pleased with the end result and the photos don’t really do the rich color that i achieved, much justice. this time i served this over basmati rice, but in the past i have parboiled whole baby potatoes with some lightly salted water in a casserole dish in the microwave, quartered and added them to the stew near the end of cooking. 1. Cut bacon into lardons (sticks 1/4-inch thick and 1 1/2 inches long). 3. Sauté lardons in 1 tablespoon of the olive oil in a flameproof (I use a 4 qt le creuset casserole) casserole over moderate heat for 2 to 3 minutes to brown lightly. Remove to a side dish with a slotted spoon. 4. Dry beef in paper towels; it will not brown if it is damp. Heat remaining bacon fat in casserole, until almost smoking. Add beef, a few pieces at a time, and sauté until nicely browned on all sides, continue until all beef is browned. Remove beef from casserole and set it aside with the lardons. 5. In the same fat, brown the sliced onions and carrots. Remove the browned vegetables and set aside. 7. Toss the meat again and return to oven for 4 minutes (this browns the flour and covers the meat with a light crust). 8. Remove casserole and turn the oven down to 325 degrees F.
9. Stir in the wine and 1 ½ cups stock, just enough so that the meat is barely covered. Add the tomato paste, garlic, herbs and sautéed vegetables. Bring to a simmer on top of the stove. 11. While the beef is cooking, prepare the pearl onions and mushrooms. 12. Heat 1 1/2 tablespoons butter with 1 1/2 tablespoons of the oil until bubbling in a skillet. Add onions and sauté over moderate heat for about 10 minutes, rolling them so they will brown as evenly as possible. Be careful not to break their skins. 13. Add 1/2 cup of the stock, salt and pepper to taste and the herb packeet. 14. Cover and simmer slowly for 40 to 50 minutes until the onions are perfectly tender but hold their shape, and the liquid has evaporated. Remove herb bouquet and set onions aside. 15. Heat remaining oil and butter in the skillet over high heat. As soon as you see butter has begun to sizzle, indicating it is hot enough, add mushrooms. 16. Toss and shake pan for 4 to 5 minutes. As soon as they have begun to brown lightly, remove from heat. 17. When the meat is tender, pour the contents of the casserole into a sieve set over a saucepan. 18. Return the beef and lardons to the casserole. Distribute the cooked onions and mushrooms on top. 19. Skim the fat off sauce in saucepan. Simmer the sauce for a minute or two, skimming off additional fat as it rises. You should have about 2 1/2 cups of sauce thick enough to lightly coat the back of a spoon. 21. Pour sauce over meat and vegetables. Cover and simmer 2 to 3 minutes, basting the meat and vegetables with the sauce several times. 22. Serve in casserole, or arrange stew on a platter surrounded with potatoes, noodles or rice, and decorated with parsley.